They say the smartest people are those that find the easiest way to do the difficult stuff. Crypto trading, for one, can be a gruesome task if you’re not properly prepared, and that’s besides taking up lots of your time. But why use up all your time staring at the trading screen when you can get TradeSanta to do the job for you? That sounds easy, doesn’t it? TradeSanta is an automated crypto trading tool that saves you all the time you would otherwise spend inputting trades every time you want to take a position. All you have to do is set it up and get busy with other stuff as the system initiates and closes trades on your behalf. Even more appealing is the fact that you can set it up in less than 10 minutes. The crypto market is a volatile space with almost all cryptos experiencing price fluctuations, and any smart trader would want to capitalize on these fluctuations to turn a profit. TradeSanta is a software platform that can do it for you – all for free. A good system is one with a user-friendly interface with easily understandable features, and TradeSanta developers know that. That’s why the system’s user interface is the easiest thing for anyone to use. As a matter of fact, you don’t even do much. You just have to specify the market parameters for your automated trading positions – like profit targets and pairings. The trading bot is granted access to your preferred crypto exchange through API keys, and that means that the bot can’t access your funds or initiate any withdrawals. At the moment, TradeSanta can be used on about 4 crypto exchanges, namely Binance, Bitfinex, HitBTC, and Bittrex, support for Bitmex, Okex and Huobi is coming soon. 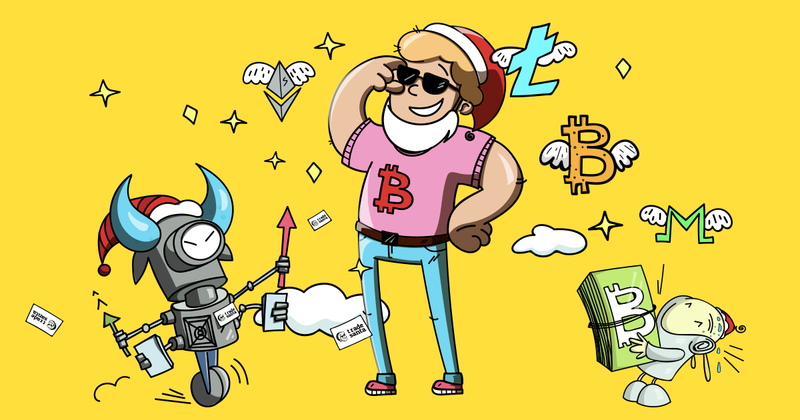 TradeSanta just started offering its automated crypto trading services for free – you can consider that an early Christmas gift. As of now, TradeSanta’s website is live, with over 1,800 active bot users and upwards of 100,000 deals already closed. That’s enough incentive for any serious crypto trader to want to try TradeSanta. If you experience any problems with the system, the bot’s live chat support known as “Santa’s Helper” is always on standby to assist. You can also get more support through TradeSanta’s Telegram channel. One indisputable advantage of using an automated trading bot like TradeSanta is that it’s active 24/7 as opposed to manual trading. Also, it’s faster. Using TradeSanta is 100 times faster than placing orders manually. Since it’s always active, the bot can keep track of market dynamics and utilize technical indicators to automatically open trading positions on a real-time basis. According to TradeSanta, automated trading removes the emotional element in decision-making and replaces it with logic derived from data mined and analyzed by the bot. That strategy works to rake in more profits – to have more chances for getting more profit, especially considering that most lose in crypto trading result from traders relying on emotions and personal biases to place orders. TradeSanta eliminates that eventuality, putting you in the best possible position to make profits. With all these advantages, and keeping in mind that the bot’s services are currently free, who wouldn’t want to use TradeSanta?